TerraPower, an energy company cofounded by Bill Gates, builds advanced nuclear reactors. The company is developing a new reactor that uses molten chloride instead of water as a coolant. TerraPower believes the design will be safer and more efficient than today’s reactors. Gates has supported nuclear-energy projects for several years, hoping that improvements in the technology can help curb the effects of climate change. A new laboratory is slated to open next year, and TerraPower chief technology officer John Gilleland said the company plans on having a prototype reactor ready in about 10 years. TerraPower is developing a line of reactors that use a molten-chloride coolant, drawing on a decades-old, but still unused, invention to lower costs and reduce waste. The most common reactors use light (or regular) water as a coolant. Following a US Department of Energy investment worth $US40 million and a partnership with energy provider Southern Company, TerraPower plans on opening a new laboratory next year. Gates’ company wants to develop a molten-chloride prototype by 2030, and the laboratory will be used to test reactor materials in the meantime. Scientists at the Massachusetts Institute of Technology Energy Initiative wrote that within the electricity sector, nuclear energy would be the least expensive solution to reducing greenhouse-gas emissions in the next few decades. But nuclear energy accounts for only 11% of the world’s electricity, according to the World Nuclear Association. 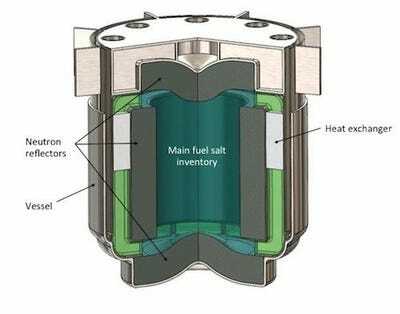 TerraPower’s liquid-chloride design, however, puts uranium fuel and the coolant in the same molten salt, Gilleland said. Fission can heat the salts directly as the mixture flows through the reactor core, and the mixture then goes through heat exchangers to generate heat or electricity, he said. Light-water reactors can’t sustain reactions at very high temperatures because the coolant evaporates. With molten chloride, though, TerraPower could operate reactors at much higher temperatures than before. In addition to generating electricity, nuclear technology could be used in high-temperature processes like fertiliser production and oil refining. The materials inside light-water reactors degrade quickly and need to be replaced roughly every 18 months, as it becomes more difficult to sustain fission with older fuel. Molten-chloride reactors, meanwhile, produce little residual waste and could theoretically run for years without the need to add fuel or get rid of waste. TerraPowerA rendering of TerraPower’s molten-chloride nuclear reactor. A forgotten war technology could safely power Earth for millions of years. Here’s why we aren’t using it. Now, with government funding and the support of billionaires like Gates, these reactors have another shot at hitting the market. TerraPower and Southern Company are working on their design with scientists from Oak Ridge National Laboratory, Idaho National Laboratory, the Electric Power Research Institute, and Vanderbilt University. In April, Florida-based company ThorCon received $US400,000 from the US Department of Energy for a joint research project with Argonne National Laboratory. ThorCon aims to begin testing a molten-salt-fuelled fission reactor by 2023. Department of Energy officials have also given $US2.1 million to Alabama-based Flibe Energy, which is using thorium instead of uranium. The molten-salt reactor movement extends beyond the US. Terrestrial Energy, a Canadian company, wants to commercialize the design for its Integral Molten Salt Reactor by the late 2020s. And in the UK, Moltex Energy is making a Stable Salt Reactor, which uses molten-salt fuel. Moltex plans on deploying its product at a nuclear-reactor site by 2030. At the same time, some nuclear startups have struggled to make their designs commercially viable. MIT-affiliated Transatomic Power, for example, shut down in September after seven years of operation. The company, founded just after the 2011 nuclear disaster in Japan’s Fukushima Prefecture, had claimed its reactors would produce electricity 75 times more efficiently than light-water reactors. In a blog post announcing the shutdown, Transatomic CEO Leslie Dewan acknowledged there had been errors in early analyses and said the company was unable to scale up fast enough. Transatomic Power later open-sourced its intellectual property for other researchers to use. If governments don’t implement new policies that reduce carbon-dioxide emissions, the bulk of the world’s energy will still come from fossil fuels, according to the International Energy Agency’s 2018 World Energy Outlook. Solar, wind, and nuclear-energy systems are not keeping up with global energy demands, the report said. About 25% of the world’s electricity comes from renewable energy sources, according to the World Energy Outlook. The International Energy Agency predicts that the share will rise to 40% by 2040, and nuclear energy can prove to be a vital factor in any changes. For Southern Company and TerraPower, the companies’ ambitious plan could produce a new reactor well before 2040. The partners are developing a prototype with the capacity to produce up to 1,100 megawatts of electricity – enough to power about 825,000 homes, according to the California Energy Commission. 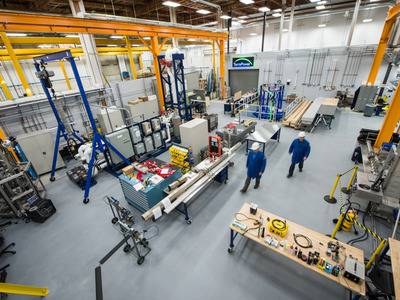 TerraPower’s $US20 million laboratory, set to open in the state of Washington next year, will help researchers ensure the reactor is safe to run. Gilleland said TerraPower will run tests with depleted uranium, which is not used in fission, to determine which materials can hold molten salt without being damaged by corrosion. Gates, who still serves as TerraPower’s chairman, has emphasised that fewer people die in nuclear-plant disasters than in coal-mine or natural-gas accidents. During a 2010 speech at MIT, he also praised nuclear energy for its potential to benefit countries where solar and wind energy are scarce.